Preston North End have signed Belgium defender Ritchie de Laet on a 28-day loan from Manchester United. The 21-year-old, who had a brief spell with Sheffield United earlier this season, has made six appearances since moving to Old Trafford in January 2009. 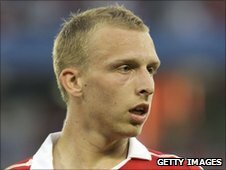 Antwerp-born De Laet started his career with Royal Antwerp before moving to Stoke City in 2007. After signing a three-year deal with Manchester United, he went on to make his debut against Hull in May 2009.